What Car Would You Import To The U.S.? Whether because of presumed American preferences or the anachronistic Chicken Tax, there are numerous vehicles like the 2011 Ford Ranger sold everywhere but the United States. Assuming magical bureaucracy-defying powers, what car would you import to the U.S.? 2011 Ford Ranger T6: Do. Want. Maybe this is a personal preference, but I'd really like to see the European BMW 335d here in God's country. 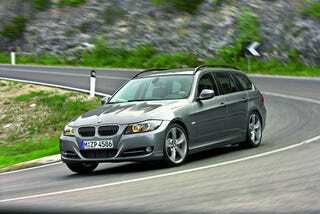 The BMW 3, in all its variants, is still a great car. Unfortunately, Americans only get the autotragic sedan version of the 335d when a diesel wagon with a six-speed manual fits our needs. The torquetastic six-cylinder twin-turbo diesel puts the car in the low 6-second range for 0-to-60 mph time, fuel economy climbs into the 30s on the U.S. cycle, and it's incredibly useful. I'm not alone in thinking this as someone started a Facebook page to call for the same thing. It may not happen, it may not be a great market decision, but I still want it.